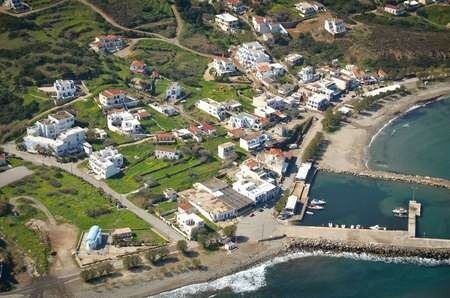 Photograph from James Prineas' Kythera from the Air. A typical photograph from the book. Ayia Pelagia from the air. In one of her essays in the book, Kiriaki Mavromattes-Orfanas explains how she always sits in the window seat of a plane in order to catch first glimpses of the Mediterranean and the seas around Kythera. She points out that these views, beautiful as they are, are seen in movement, you cannot ‘fix’ the image and peruse it at your leisure. With James Prineas’ book in your hand, that is precisely what you can do, however. As Kiriaki states, “it is this view which makes this publication such an interesting one. Because here in these images, you get to see the villages and towns of Kythera, its beaches and hillsides, its monasteries and churches, its vineyards and olive groves, its cypress trees, its roads and rivers and gullies and ravines, its hidden ponds and ancient waterways. You become aware of the precipitous nature of its cliffs and the stark rise of its mountains. You get to see where worked land ends and wilderness begins. The islands wounds and scars become apparent to you and you cn hear the e echoes of the silence of those now still, but once vibrant villages left' ‘erima kai mona’ as their population slowly deserted them. You can follow the coastline, noting were it is accessible and where it is not and wonder about which beaches Helen went to with Paris, looking for a private moment with her lover before she made that fateful choice and plunged her world into war. And your favourite beach, or your grandfather s house, or the home you grew up in, is presented in a different way and you can finally see the sense of the division of family property - the ‘adelfomerasmata’. From the ground you may not be aware that your village is surrounded on three sides by a ravine, or how high it sits above the sea, but seeing it from above, you get to understand why itis where it is and how the terrain is king”.